“The Rejuvenation” Organic Millet Pillow is specifically made for side and back sleepers. It provides a great solution for side sleepers who need between 4″ – 6″ of pillow height. 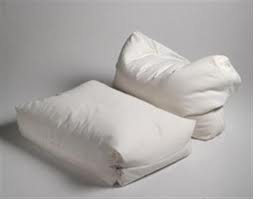 Most pillows do not give you that much, which is why many people wake with their neck in an uncomfortable position. With this pillow,you do not end up awakening and trying to adjust the pillow. Once your head and neck are aligned and cradled in the millet pillow you have a better chance at staying asleep. That’s what its all about. With the manufacturers dual chamber design you get a generous foundation of mold-able hulls to keep your head elevated and your neck aligned.Plus you get a soft layer of wool batting on top to cushion your face and ear. Together these two fillings help you keep and maintain comfortable spinal alignment all night long. The pillow is also easily adjusted: Place the pillow on your bed with the wool on top for 4″ of loft. If you are broad shouldered and need more loft, rotate the pillow a quarter turn so that it sits on its side with the wool facing you. In this position the Rejuvenation Organic Wool/Millet Pillow also makes a great headrest to prop yourself up for bedtime reading. For a softer feel and less support you can easily open the zipper and remove some of the hulls. Made with Certified Organic Cotton Ticking in Natural, Certified Organic Millet Hulls and Pure Eco Wool®.